Laura R. Olson is professor of political science at Clemson University. A native of Racine, Wisconsin, she earned a B.A. in political science from Northwestern University in 1990, as well as an M.A. (1991) and Ph.D. (1996) from the University of Wisconsin-Madison. She spent the 1999-2000 academic year as a visiting research fellow at the Center for the Study of Religion at Princeton University. Her research focuses on contemporary religion, civic engagement, and American politics, and has placed special emphasis on the political attitudes and behaviors of clergy. 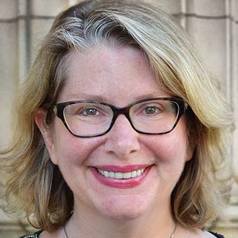 Her work has appeared in leading scholarly journals, including Political Research Quarterly, Social Science Quarterly, and the Journal for the Scientific Study of Religion. She is the author, coauthor, or coeditor of nine books, including Religion and Politics in America: Faith, Culture, and Strategic Choices (Westview Press, 2018); Beyond Red State, Blue State: Electoral Gaps in the Twenty-First Century American Electorate (Prentice Hall, 2008); Religious Interests in Community Conflict: Beyond the Culture Wars (Baylor University Press, 2007); Women with a Mission: Religion, Gender, and the Politics of Women Clergy (University of Alabama Press, 2005); Christian Clergy in American Politics (Johns Hopkins University Press, 2001); and Filled with Spirit and Power: Protestant Clergy in Politics (State University of New York Press, 2000). She was editor-in-chief of the Journal for the Scientific Study of Religion for five years. She also has served two terms as chair of the American Political Science Association’s Religion and Politics section and one term on the American Academy of Religion’s Committee for the Public Understanding of Religion. She is a member of the editorial board of Social Science Quarterly. A frequent source for various media outlets, she has been interviewed on CNN, National Public Radio, and BBC Radio and quoted in The New York Times, The Los Angeles Times, The Washington Post, and USA Today. She also won Clemson University’s campus-wide Fluor Daniel Student Government Excellence in Teaching Award in 2003.